Sandy Millin: I'm a terrible student - motivate me! When I first started teaching, I used to get really frustrated when I set homework and my students didn’t do it. Then I realized that I was just as bad. At school, I’d always been good at doing homework, but as an adult I just can’t seem to get into the habit. When I had a Czech lesson, I would always do my homework the night before, regardless of how long I had between lessons. Now that I’m learning Russian, doing homework the night before is just a dream, and my teacher has stopped asking me whether I’ve done anything between classes. Needless to say, I’m much more forgiving of my students now! However, that doesn’t mean that I don’t set homework, or try to encourage my students (and myself!) to study between classes. Here are three things I’ve tried which seem to work, for some students at least! Edmodo is a social network for education. It looks a bit like facebook, but groups are closed. This means that you can only see what is posted if you have a ‘group code’ for your class. I use Edmodo to set homework, so nobody can say they didn’t know what it was. Students can send me their homework through the site, and I can track their grades all in one place. The site also has a ‘quiz’ function, which is a great way of providing revision. As well as using it for homework, I post extra links related to things we’ve been doing in class. For example, if we’ve listened to a song, I can share it with the students for them to listen again at home. If we’ve read an article about a cultural event, I might share a YouTube video showing the event in action. 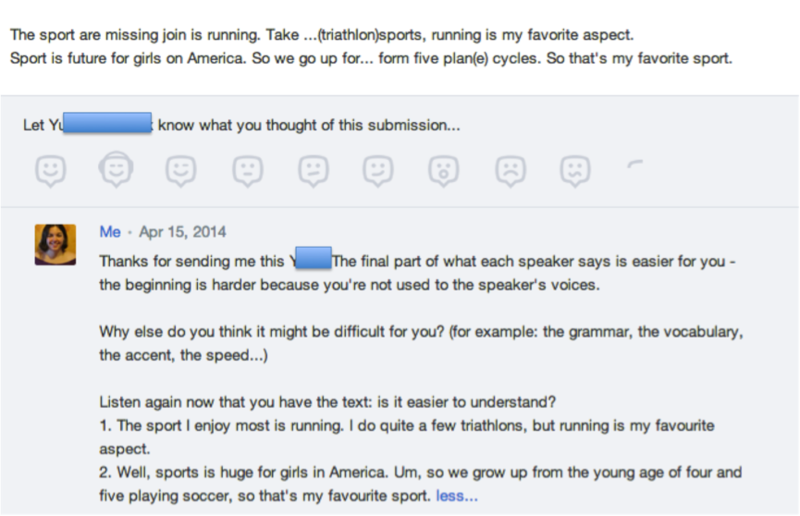 The groups I use Edmodo with are much more likely to do their homework, and I get to know them faster. Using Edmodo means I can easily make homework a bit more creative, rather than simply giving exercises from the workbook. One of the most successful activities I’ve tried is micro-dictations, which I now set every two to three weeks. Find or record a very short audio clip, 20 seconds at most. You can clip one from a longer text using www.mp3cut.net. Share the recording with students on Edmodo. They have to write what they hear. In class, we talk about the biggest problems students have, and I can use it as a needs analysis tool. The students who regularly do this have noticed a real improvement in their listening skills, and more of them are doing the activity since they heard from their classmates. My all-time favourite way of encouraging students to practise outside class is Quizlet, a website designed to help you learn vocabulary. It has different activities designed in a fun way, allowing students to play games and compete with each other, as well as themselves (beating their own best time for example), to learn the words. I use it almost every day with my students, either on my laptop or on the projector if I’m in the right classroom. If I’m not, we use my students’ tablets and phones and they play in pairs or small groups in class. Once they’ve tried it at school, they almost always start using it at home, although sometimes they need to be reminded a few times! Every time we study vocabulary in class I create a Quizlet set to accompany it, and share the link on Quizlet. I also share my student guide, giving a step-by-step introduction to the site. It’s important to put yourself into your students’ shoes, and realize that we all have busy lives. Quizlet is the one thing that I do use for my Russian outside class, as I can play on it for a few minutes at a time without needing to make too much of an extra effort. It integrates with my lifestyle in a way that filling in exercises doesn’t. By making the activities we give our students varied and easy to access, it helps them to make the most of their precious study time outside class. If you have any more ideas for good activities or resources, I’d love to hear them!